Every now and then an idea pops into my head that turns out to be great. It doesn’t happen very often mind you. Most often my ideas are total flops. But this one, this turned out to be pretty good, if I may say so myself. 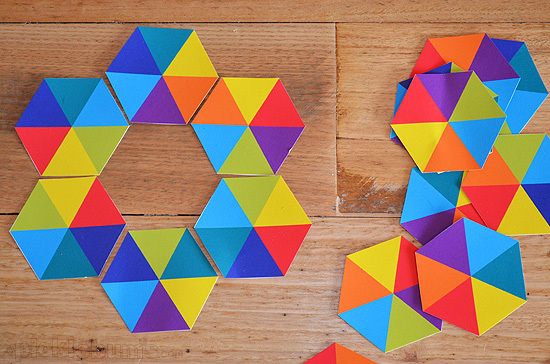 It’s a simple idea, just a whole lot of hexagons with different coloured sections. We’ve dubbed them ‘Hexi Cards’. 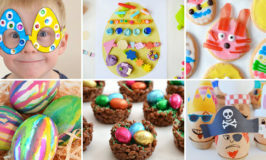 The joy of this idea is that they are simple, easy to create, and can be used in lots of different ways. Noah (who is 2 and a half) is learning his colours and used the cards to name colours and begin to match them. 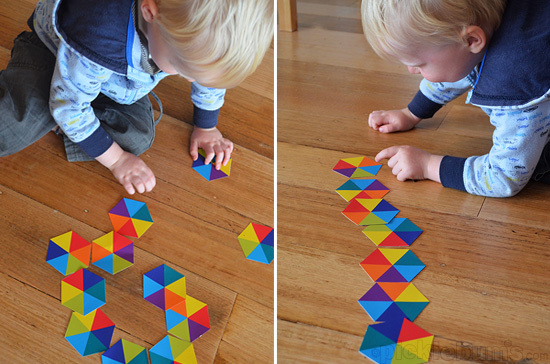 He also likes to line things up, make patterns and shapes so had a lovely time playing around with two sets of cards on the floor. 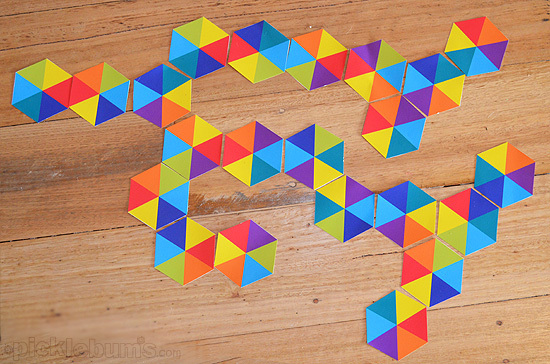 The big kids (5.5 years and nine year old twins) also enjoyed making patterns with the bright coloured hexagons, but they soon made up their own dominos type game. Using three sets of cards (one set each) they took it in turn to match coloured wedges. The girls took this one step further and added a maths component. For each colour you match you get one point. If you can match two or three colours in one go you get a point for each colour. They added up the scores on paper as they went along, practicing simple addition as well as problem solving, turn taking and more. So much fun from a simple set of hexagons. 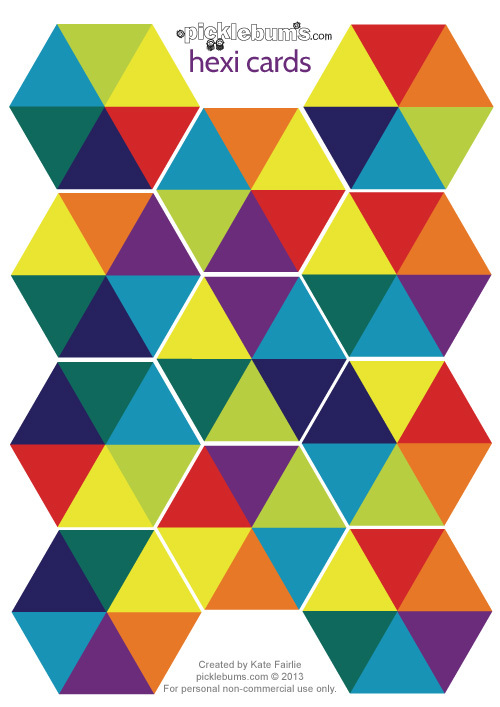 You can download the free printable Hexi Card pdf here, or click on the image above. Print a few copies onto card, cut out and start playing! What are you going to do with our Hexi Cards? We’d love to see how you play with them so feel free to pop over to my facebook page and share a photo. For more free printable resources and activities check out our printables page. 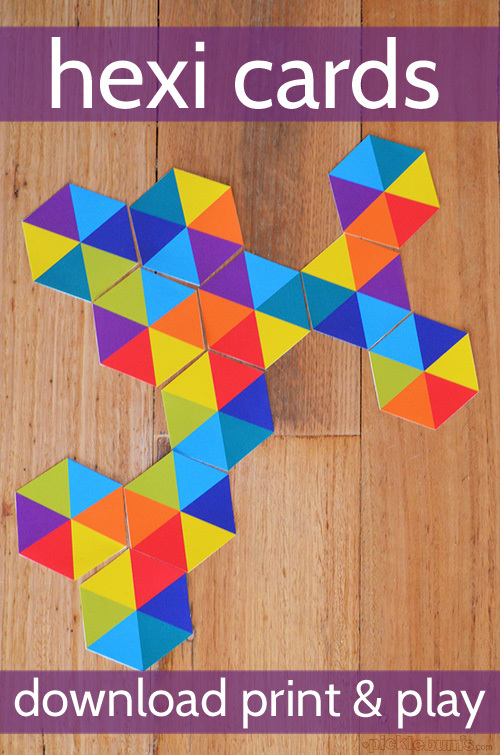 I used to play with a similar set when I was little – I seem to recall that each vertex had a third of a coloured flower printed on it and when all were lined up it looked like a flower garden. I had forgotten all about that till just now – thank you for reminding me! oh making flowers sounds like an awesome idea!! I wonder what other versions I could make with added shapes… hmmm how you have got me thinking!! Thanks a lot for sharing with us! I’m sure my kids will also enjoy it! This is brilliant! I bet you could very successfully sell these! I found these on Pinterest earlier today and printed them out immediately for my three year old. he loved them and played with them for the last half hour before dinner. Thank you! Those are so beautiful and fun! I can’t wait to try them with my preschoolers. I know they are going to have lots of fun learning their colors with it. Pinned! Thank you. This is fabulous! My printer is broken! grr! But these are in the ‘to print’ file!! :) Woo! Thanks..sharing now! Brilliant. Can’t wait to print and play. You are so clever Kate! Thanks so much for making these a printable and sharing with us…pinning now!! This is a great idea! Thanks for sharing them with us! Get out. These are soooo cool! I cannot believe we just ran out of ink in my printer, but I’ll pin this and print them out tomorrow. My 3 year old will be thrilled to mess around with these! Oh these are just brilliant – off to print now. This is fantastic!! What a great idea! Thank you!!!! These are wonderful, Kate! Thanks so much for sharing them! I featured your printable as the Free Printable of the Day at the Living Montessori Now Facebook page https://www.facebook.com/LivingMontessoriNow and on Pinterest. These hexagon are fantastic play things! Its colorful, its fun and educational! Thanks! Thank you for sharing. Hopefully I can use these later to entertain my son when the new baby arrives. OMG, thank you Kate, these are so awesome! I decided my daughters 2nd birthday would be a rainbow theme but I don’t have either the time, money or creativeness to do the stuff you find on pinterest. I’m going to print these and give out in the favour bags – I’ve been trying to think of something cheap but that is suitable for both the big and little kids – you have totally hit the jackpot!!! What kind of card do you print them on Kate ? I have a Canon printer so I use Canon matte photo paper which is just like medium weight card. But you could print them on regular photo paper or even on plain paper and laminate or contact them if you like. How fun! These look awesome. I can’t wait to see what my girls do with them. Thanks for the post! Yes! Yes! Yes! How is it that I haven’t seen this post before? This has to be one of my all time favourite easy but fabulous DIY activity ideas, Kate! Brilliant! You can bet I’ll be making some of these for the hooligans in the new year!! I printed it four times – one remained as a board and three were cut into pieces- so we can play board matching as well with the smallers, and a quite long point counting side-matching game with the olders (9 and 12 years old). They loved it, and also cuttig out was a challenge for them too! These are beautiful. What a fun way to play with colors and reinforce understanding of hexagons! LOVE! I really like your game. I used my scrapbooking program to re-size them to fit in an altoid tin (2 stacks, side by side). I added magnetic paper to the back of them so my kids can play with them on a cookie sheet. Perhaps you\’d like to release a version like that (since I won\’t infringe on your copyright by putting my file on my blog). Unfortunately we don’t have Altoids here so I can’t create a set to fit a tin, but they are fairly easy to resize smaller and adding magnets is a great idea.